In our long history of staring up at the stars, human beings have assigned various qualities, names, and symbols for all the objects they have found there. Determined to find patterns in the heavens that might shed light on life here on Earth, many of these designations ascribed behavior to the celestial bodies. When it comes to assigning signs to the planets, astrologists and astronomers – which were entwined disciplines in the past -made sure that these particular symbols were linked to the planets’ names or their history in some way. Consider the planet Mercury, named after the Roman god who was himself the messenger of the gods, noted for his speed and swiftness. The name was assigned to this body largely because it is the planet closest to the Sun, and which therefore has the fastest rotation period. Hence, the symbol is meant to represent Mercury’s helmet and caduceus – a herald’s staff with snakes and wings intertwined. Mercury, as imaged by the MESSENGER spacecraft, which was named after the messenger of the gods because it has the fastest orbit around the Sun. Image Credit: NASA/JHU/Carnegie Institution. Venus’ symbol has more than one meaning. Not only is it the sign for “female”, but it also represents the goddess Venus’ hand mirror. This representation of femininity makes sense considering Venus was the goddess of love and beauty. The symbol is also the chemical sign for copper; since copper was used to make mirrors in ancient times. Earth’s sign also has a variety of meanings, although it does not refer to a mythological god. The most popular view is that the circle with a cross in the middle represents the four main compass points. It has also been interpreted as the Globus Cruciger, an old Christian symbol for Christ’s reign on Earth. This symbol is not just limited to Christianity though, and has been used in various culture around the world. These include, but are not limited to, Norse mythology (where it appears as the Solar or Odin’s Cross), Native American cultures (where it typically represented the four spirits of direction and the four sacred elements), the Celtic Cross, the Greek Cross, and the Egyptian Ankh. In fact, perhaps owing to the simplicity of the design, cross-shaped incisions have made appearances as petroglyphs in European cult caves dating all the way back to the beginning of the Upper Paleolithic, and throughout prehistory to the Iron Age. Mars is named after the Roman god of war, owing perhaps to the planet’s reddish hue, which gives it the color of blood. For this reason, the symbol associated with Mars represents the god of wars’ shield and spear. Additionally, it is the same sign as the one used to represent “male”, and hence is associated with self-assertion, aggression, sexuality, energy, strength, ambition and impulsiveness. Jupiter’s sign, which looks like an ornate, oddly shaped “four,” also stands for a number of symbols. It has been said to represent an eagle, which is Jupiter’s bird. Additionally, the symbol can stand for a “Z,” which is the first letter of Zeus – who was Jupiter’s Greek counterpart. The line through the symbol is consistent with this, since it would indicate that it was an abbreviation for Zeus’ name. And last, but not least, there is the addition of the swirled line which is believed to represent a lighting bolt – which just happens to Jupiter’s (and Zeus’) weapon of choice. Like Jupiter, Saturn resembles another recognizable character – this time, it’s an “h.” However, this symbol is actually supposed to represent Saturn’s scythe or sickle, because Saturn is named after the Roman god of agriculture. The sign for Uranus is a combination of two other signs – Mars’ sign and the symbol of the Sun – because the planet is connected to these two in mythology. Uranus represented heaven in Roman mythology, and this ancient civilization believed that the Sun’s light and Mars’ power ruled the heavens. Neptune’s sign is linked to the sea god Neptune, who the planet was named after. Appropriately, the symbol represents this planet is in the shape of the sea god’s trident. Although Pluto was demoted to a dwarf planet, it still has a symbol. Pluto’s sign is a combination of a “P” and a “L,” which are the first two letters in Pluto as well as the initials of Percival Lowell, the astronomer who discovered the planet. The Moon is represented by a crescent shape, which is a clear allusion to how the Moon appears in the night sky more often than not. Since the Moon is also tied to people’s perceptions, moods, and emotional make-up, the symbol has also come to represents the mind’s receptivity. And then there’s the sun, which is represented by a circle with a dot in the middle. In the case of the Sun, this symbol represents the divine spirit (circle) surrounding the seed of potential, which is a direct association with ancient Sun worship and the central role Sun god’s played in ancient pantheons. The planets have played an important role in the culture and astrological systems of every human culture. Because of this, the symbols, names, and terms that denote them continue to hold special significance in our hearts and minds. We have many interesting articles on the planets here at Universe Today. For example, here is other articles including symbols of the planets and symbols of the Sun and Moon. 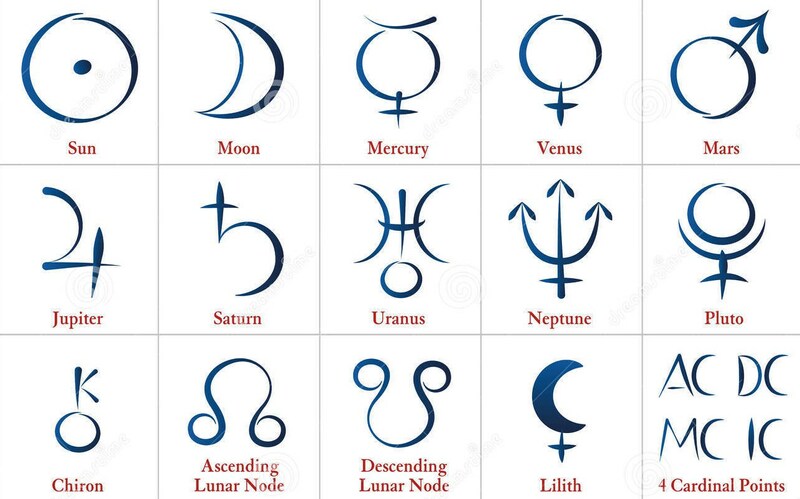 If you are looking for more information try signs of the planets and symbols of the minor planets. Astronomy Cast has an episode on each planet including Saturn. Universe Today has articles you will want to check out on symbols for the Sun and Moon and symbol for Earth. If you are looking for more information, take a look at this website from NASA on the astronomical symbols or on the symbol for Pluto. Astronomy Cast has an episode on each planet, so listen to all of them in order starting with Mercury.